A woman suffered 18 miscarriages over two decades before finally giving birth - at the age of 48. Louise Warneford suffers from a condition which causes ‘killer cells’ in her body to destroy unborn embryos. Despite spending £80,000 on IVF treatments over nearly 20 years, she agonisingly lost 18 babies. 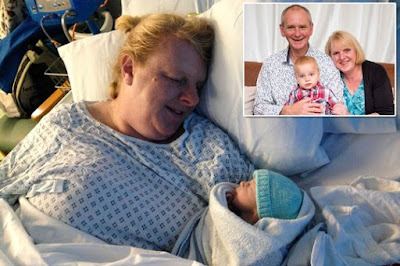 Louise and husband Mark, 55, made the devastating decision to give up trying for a baby in 2010. But she knew she needed to give herself one last chance of achieving her dream of becoming a mum. The couple, from Swindon, Wilts, underwent embryo donation in the Czech Republic in 2015. Incredibly Louise fell pregnant and gave birth to son William in June last year - 18 years after first trying for a baby. She said: “Mark and I had been trying for a baby since I was 32. “We'd suffered 18 miscarriages and spent £80k but looking at William now, it was all worth it.